Alela Diane’s set opening for Blitzen Trapper on Friday night was a revelation. We were familiar with her fine songs only so far as are featured on her MySpace page. What became clear on Friday was that this young woman has an incredible range of vocal talents and has put together an excellent band to compliment her. What is more wonderful is that her father is the lead guitar and mandolin player whose melodic fret work drives the band. Alela mentioned that this night was her father’s first trip to NYC, and one can only imagine the pride and joy as he accompanied his daughter to the big city for this show. The set included seven tracks from her new album To Be Still released just ten days earlier, and one stunningly executed Fleetwood Mac cover. 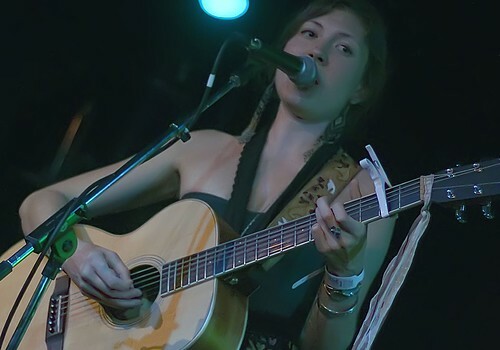 Alela promised she would be back in NYC soon with a longer set, and we are sure to be there. This recording was captured from the identical location as the Blitzen Trapper set and the sound is outstanding. Enjoy! If you email nyctaper for access to this recording, we expect that you will PLEASE SUPPORT Alela Diane, visit her website, visit her MySpace page, and purchase her new release To Be Still directly from Beggars Group/Rough Trade [HERE]. Thank you. I just discovered her, so this is a welcome find. thank you sir! like Thomas said, I just discovered her too, with “every path”. This is stunning. THANK YOU so much for all the time and effort to make this available. Her records and voice are astonishing (for those discovering her). This is a real gift.